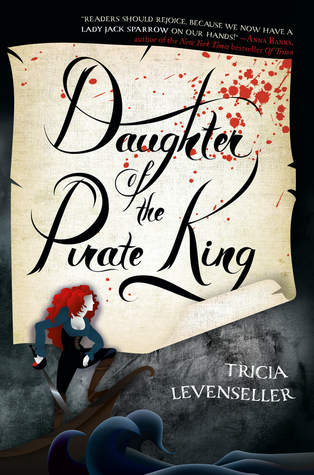 I've had Daughter of the Pirate King by Tricia Levenseller on my TBR for a while now, and I'm seriously kicking myself for waiting so long to read it. I mean, not only is it about pirates, but LADY pirates, which are definitely the best kind! I really enjoyed this book so much more than I expected to. It was great! There are so many characters in this story that I absolutely loved, including the main character, Alosa, who just happens to be a pirate princess, and is completely awesome in every single way. I loved everything from her snarky attitude, to the fact that she could hold her own in almost any situation. Meaning, she's a badass, but one with a kind heart. She's definitely one of my favorite heroines, especially because of the pirate thing. *wink* There are a lot of great characters in the story, I could seriously go on and on about them, but I'd rather you read the book and meet them for yourself! As you've probably gathered so far from my rambling so far, I really enjoyed this book. I have a thing for all things pirates, and this being about a pirate princess was right up my alley. There are seriously not enough pirate books in my life at the moment, and the few I have read have been awesome. I'd love to have more! This book is definitely a welcome addition, and I can't wait for my finished copy to arrive. Overall; I really enjoyed reading Daughter of the Pirate King SO MUCH, and I absolutely can't wait to get my hands on the sequel, which is currently untitled, but is set to release in 2018. I must know what's going to happen next for Alosa and her crew! OOh nice! I'm still debating over this one myself but it's looking more and more likely that I might have to pick up a copy! I too love a good pirate story! Ever since POTC hit the screens in 2003 I've loved pirates! Though they aren't around much in books! I've read Nicole Castroman's and really enjoyed those! Also Unhooked was really good! A hot Captain Hook fits the pirate bill any day! LOL! Glad to hear you enjoyed this one! Great review! I'm so happy to see that you enjoyed this! I think that I'll be getting it in a subscription box this month. I'm excited to read it.